We’re consistently blown away by the things young people are doing in the publishing space—whether they’re writing full-on novels or launching websites for teenagers. 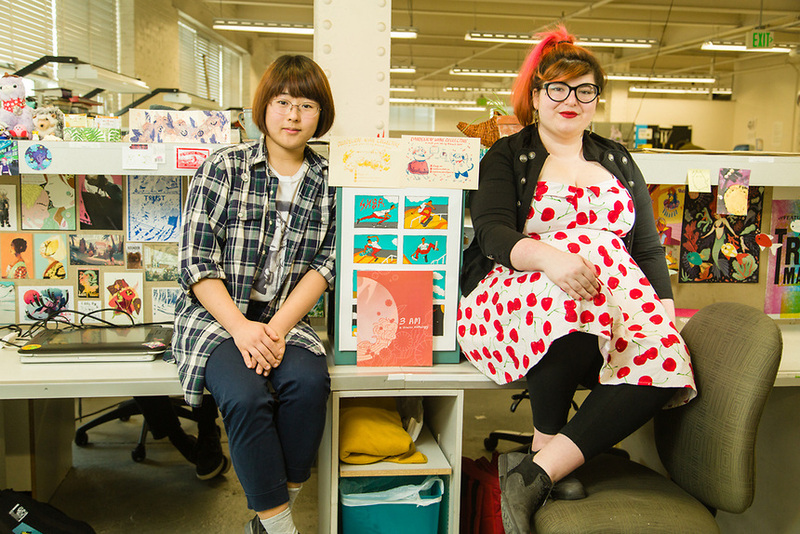 Another recent shining example: MICA graduates Paloma Hernando and Sunmi (first name basis), who just launched their own comics and illustration micro-publishing company called Dandelion Wine Collective using a grant funding from MICA’s UP/Start Competition, which nurtures arts-based business ideas and ventures. Dandelion Wine Collective may still be in the baby stages, but the publisher is ambitiously growing its current two-book roster. Below, Hernandez and Sunmi elaborate on their commitment to publishing diverse stories, providing a platform for marginalized voices, and why they are excited about the future as newly graduates. Hi! Can you describe the mission behind Dandelion Wine Collective? Our mission is to make good comics! That was always the most important part to us, but as two independent artists ourselves we also recognize the importance of fair wages for creators, diversity in the industry, and focusing on strong voice and community. 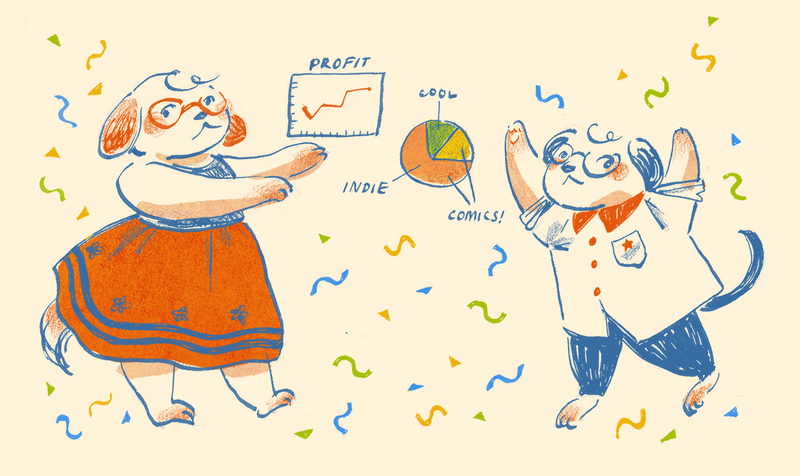 We want to bring the values and drive of indie comics to wider platforms, and work to make comics an even more accessible space for all voices and stories. What do you feel is missing from the comics and illustration landscape currently? Paloma: The connection between creators and readers. I think comics really excel at their ability to communicate, and the idea of taking advantage of that is exciting! Sunmi: What draws a lot of newcomers and younger generations to indie comics is the ability to tell your own story from a uniquely personal place. At least for myself, being able to write, illustrate, and share my own work feels very freeing and powerful, especially because I like having full control and rights to my own work. A lot of platforms now provide opportunities and resources to support and publish independent artists. Some turn out to be questionable in intent and practice, while others are well-meaning but not sustainable in terms of providing living wages. Ultimately I think it’s most beneficial for everyone in the comics and illustration world to be honest and straightforward with their business practices. What are your personal backgrounds? How do your own histories contribute well collaboratively to what you want to accomplish with Dandelion Wine Collective? Paloma: It’s funny, because even though I loved drawing and writing, it was really hard to find comics I thought were “for me.” I still have a hard time finding a superhero comic that I like. Some of the first things I truly connected to were reading books and comics by women like J.K. Rowling, Tamora Pierce, Meg Cabot, Hiromu Arakawa, and many more. I also knew pretty early that I loved putting together projects and connecting with people—I was always the “bossy loudmouth” when I was younger, but hopefully I’ve managed to work that to my advantage and reach out to other people who want to make stuff happen. Sunmi: I grew up consuming a lot of media while also finding and utilizing every outlet available for expressing my ideas and stories. I love learning, storytelling, and indirect ways of building emotional connections with people and memories and things. I wouldn’t consider myself a natural organizer or leader in any way, since I deal with a lot of social anxiety and mental health struggles, but I’ve grown to find myself in a place where I’m just as capable creating opportunities for other artists, as much as I am finding them for myself. Why do you like working with each other? Paloma: In my opinion, it’s really good for me to work with Sunmi because she just knows more about comics than I do, and is a lot less pessimistic a lot of times. Sunmi: Paloma is very smart and organized and powerful! We both give each other strength and confidence to make more work and better work. Our first collaboration was a twine game we did in 2015 for a gallery show organized by our illustration department and faculty member Dan Krall. After that, we just kept doing stuff together, saying yes to bigger things, and now we are here! Having two of us makes a really nice system of checks and balances. There’s always someone on your side, and you are never stranded with too much to do. What are some of your favorite works that you put out recently and/or currently working on? 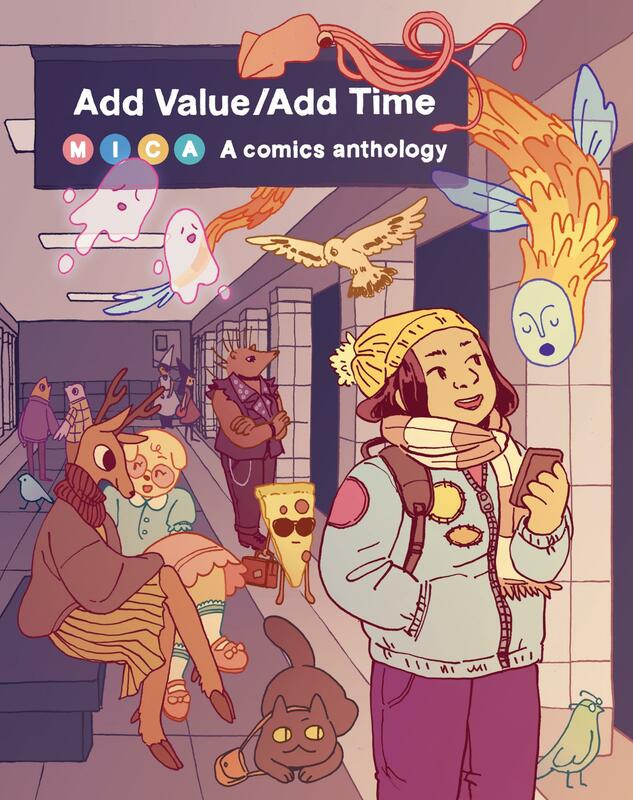 Paloma: I gotta say, I was really happy with how our last anthology “Add Value/Add Time” came out, but I’m also super excited for our upcoming anthology “The Sun and the Wayward Wind” which is all about North American myths and legends. Sunmi: We only have two previous books and they are both good. Our next anthology will also be good! How can aspiring writers and illustrators submit their works for consideration? What kinds of stories are you looking for? We are currently set for the next year, as the recent grant we received from the MICA UP/Start competition will fund our next line of books. However, we will have a call for pitches coming up for one of those books, which is an anthology centered around Asian-American diaspora and identity in relation to food. Our guest editor, Margaret Huey, came up with the idea, from the desire to explore feelings of “third culture” from the lens of food culture, since food is significant to personal identity, along with building communities and connections to cultures worldwide. But also, our inbox is always open to writers and illustrators with big ideas! Please do not hesitate to email us, or stay connected with us on our blog, Twitter, Instagram, or website. We both appreciate and look for work that tries something new, or highlights something that could only come from the artist’s perspective. As recent graduations, just must be getting this question a lot, but what are your immediate next plans? Kickstarter! We aim to launch in July, and we can’t wait to get this anthology out into the world. We are also focusing on getting set up as business, and using the grant money from UP/Start to build a strong base for our publishing press. Keep an eye out for our 2018 line of books! We’re excited to move forward and keep learning and growing.